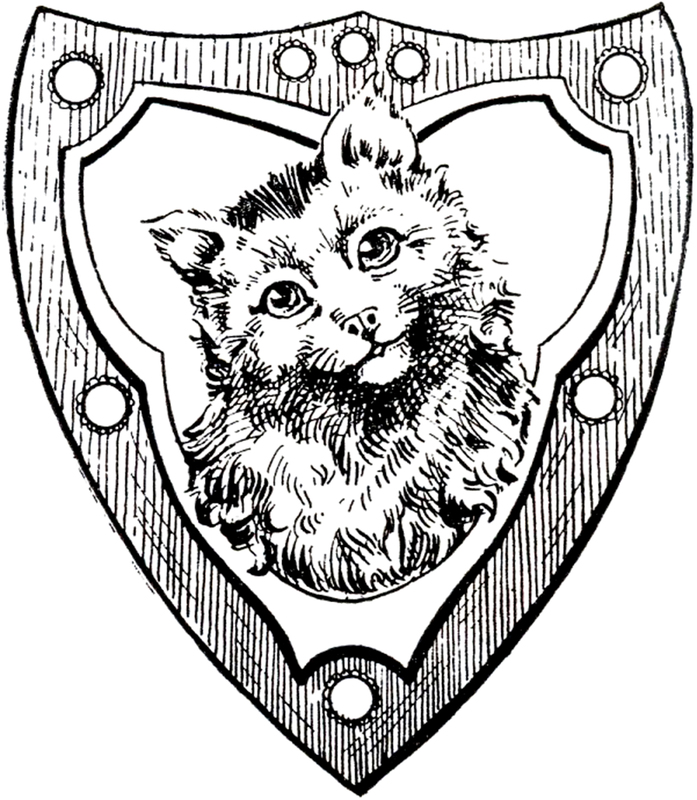 This is an interesting Vintage Cat Shield Image! This one comes from a book in my collection, it’s a rare Circa 1907 Pyrography Catalog! The catalog is full of patterns, tools and accessories for the art of Pyrography, which is when you burn a design into wood. This intricate design would have been used for that purpose, and added to boxes or small furniture pieces. Featured above is a rustic looking Wooden Shield with a cute Cat on the front of it! You might like a similar image from the same book, you can find that one HERE. How cute! When we were planning our outfits for the Renaissance Festival, my daughter wanted a shield with a Unicorn. When my son said he wanted to be Robin Hood, she decided she wanted to be Maid Marion! Do you have this shield without anything in the middle, just a blank shield? Thank you for all you share, Have a Blessed Day, from Port Huron, Michigan. How fun Susie! Here’s a link to all of the shields that I have https://thegraphicsfairy.com/?s=shield . There’s one red and white checked one that’s fairly plain, and there’s one with a Horse, perhaps you could add a horn to the Horse and make him into a Unicorn? Just started new Hobby! Perfect shield for last name Cheshire. Thanks so much to your site?